The beginning of this lens’s test is untypical as I decided to start it with a kind of personal reflection. I like testing Olympus lenses very much and there are many reasons behind it. Above all, most of them are very well- made devices, popular and praised by users and in our tests. Such a position is perfect as it satisfies everyone. 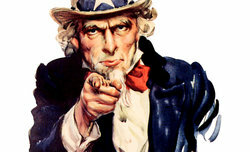 We are happy because we don’t have to witness any system wars in the comment section, the users of the system are content because they know what they should spend their hard-earned money on, the distributor is pleased because of a good result of products they sell, the shop, lending the lens for the test, is satisfied because a good result means also bigger chance that somebody will buy the tested lens after all. The second advantage is an uncomplicated cooperation of the Zuiko lenses with such bodies as an E-3, which we use in our tests. We don’t experience any problems with front focus or back focus; what’s more the autofocus in most of the cases is accurate so, as a result, I have less work with the test itself. There’s still one „but”. While testing Zuiko lenses I must fight against myths and oblique statements, used only too readily by the producer as a part of their marketing strategy. First problem consists of too many generalizations and saying that lenses designed to work on small 4/3 system sensors can be smaller and physically lighter than their full frame or APS-C/DX counterparts. While it is true for telephoto lenses in most cases, it often doesn’t work at all in the case of wide-angle instruments. Combining wide angles of view and good fastness on a small 4/3 sensor is more difficult than on full frame and it entails a bigger complexity of optical system so any advantage in the form of lower weight or/and smaller dimensions is often not possible to get. 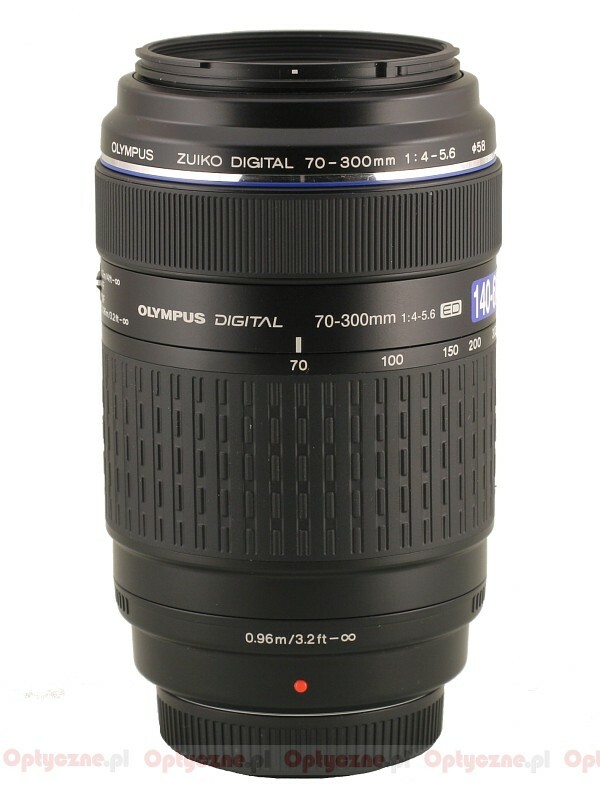 In the following chapters we are bound to find out what the situation of the Olympus 70-300 mm really looks like compared to marketing announcements of the producer. 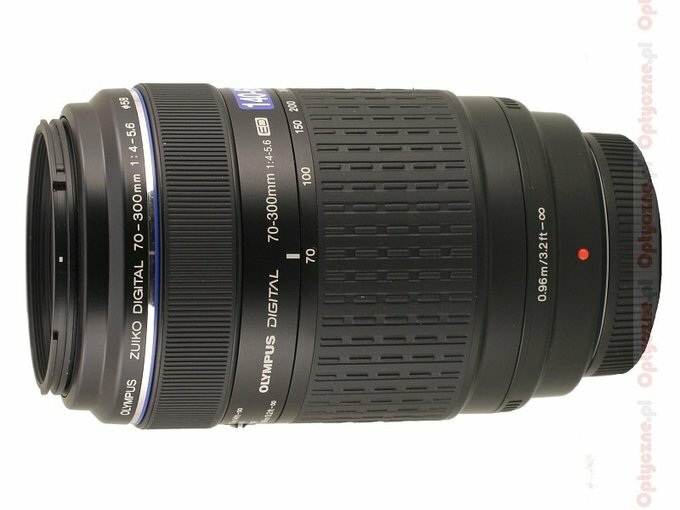 The second issue is the unfortunate aperture multiplier and saying that using a 70-300 mm lens we can get full possibilities of a 140-600 mm class lens. It is true only and solely when it comes to the angles of view, nothing more. If you deal with the quality of the image (on low speeds) we should have had one and the same 70-300 mm class lens, able to work on different systems reflex cameras; then, putting it on a Nikon D300, a Canon 450D or an Olympus E-3 would have given us the same results because those reflex cameras feature very similar resolution in the frame centre. A picture crop of the Olympus doesn’t help us at all because we can cut out the 4/3 picture format from images taken using Nikon and Canon sensors and present the same result. That’s why describing the Olympus 70-300 mm I am going to compare it to other 70-300 mm lenses, as it should be done, not to an imaginary 140-600 mm model. 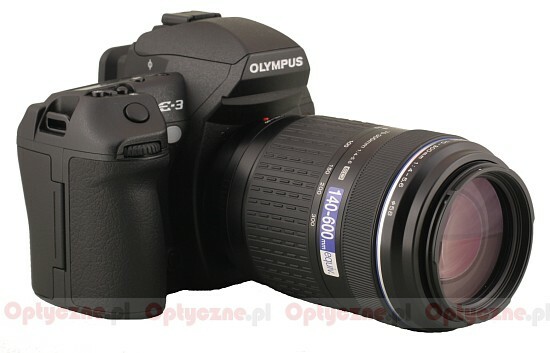 The lens for the tests was lent by the Fotozakupy.pl shop.